Operators at Wat Pha Luang Ta Bua temple, known as the "Tiger Temple", are accused of wildlife trafficking and animal abuse. They deny the charges. On Wednesday, wildlife officials found the bodies of 40 dead tiger cubs at the temple complex. 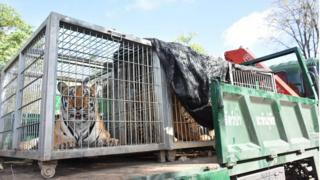 The discovery came during a week-long effort to relocate 137 tigers from the tourist site in Kanchanaburi province. The temple operators had resisted previous attempts to remove the tigers. Police intercepted the monk, and two other men, in a lorry leaving the temple in western Thailand on Thursday. The authorities confiscated two full-length tiger skins, about 700 amulets made from tiger parts, and 10 tiger fangs, Teunchai Noochdumrong, director of of the Wildlife Conservation Office, told the BBC. "This confiscation shows that the temple is likely involved in illegal tiger trade. They are clearly violating the law in selling, distributing of transferring the protected animals or their parts," she said. Wildlife authorities in Thailand have said they will press charges against the temple. On Wednesday, tiger cub corpses were found in a freezer at the complex, along with body parts from other animals. Police Col Bandith Meungsukhum told the Agence France-Presse news agency the cubs would have been one or two days old, but it was not clear how long they had been dead. They will be DNA tested to see whether they were related to other tigers at the site. Officials say the temple operators could be charged with keeping the carcasses without permission. The temple previously said it had decided in 2010 to stop cremating cubs which died soon after birth. It has always denied trafficking allegations. Authorities started the operation to remove all 137 living tigers from the temple on Monday. Dozens have already been removed, and taken to animal refuges. The site, west of Bangkok, is a popular tourist attraction, with visitors able to pose for photos with the animals for a fee. It has been closed to the public since the raid. Animal activists and former workers have claimed the tigers are mistreated and kept in small concrete cages.